Life happens. Everything can change in an instant. The Northeast saw this with Hurricane Sandy and then Nor’easter Athena. Within hours, everything just became complicated. But it doesn’t take such a catastrophic large-scaled event to push someone to start stockpiling. It can take a very personal event like… being placed on bed rest or breaking your foot instead. Something that is contained within your family but is detrimental to your every day routine. To personalize this point – you all know where I am. On bed rest. For at least another 8 weeks. It hasn’t been easy on anyone, but you better believe my husband’s load is a little lighter because of what’s going on in my basement. We – without knowing it – have been preparing for this life change for over a year. I’ve been slowly stocking up on toiletries, paper goods, medicine, cleaning supplies and non-perishable food. And THANK GOODNESS for it! For example, this morning our master bathroom ran out of toilet paper, hand soap, and toothpaste. All in one shot. If I didn’t have an arsenal ready for Bill downstairs, we would have had a problem. But all he had to do was walk down a flight of stairs to restock. It was in that instance that I realized how important my mini-stockpile was to this family. All those hours clipping coupons and store hopping really paid off. It took this morning for me to see it for the very first time. Prior to all of this, stockpiling was a game to me. Can I beat the system? Am I smarter than “the man”? That’s all it was – something fun. Well, now I see it in an entirely different light. I will never stop couponing. I will never stop storing goods that my family needs. Because who KNOWS when the next hurricane / illness will strike? Talk about planning ahead. I know you see me write about couponing a lot. I post deals once a day and always try to show you how I pulled off my scores (it’s been a while since I can’t leave the house). But longtime readers will remember all the videos / coupon breakdowns I used to post. Please consider starting. Even if it’s on a really small scale. I’ve written several posts (here and here and here) filled with tips on how you can get started couponing. 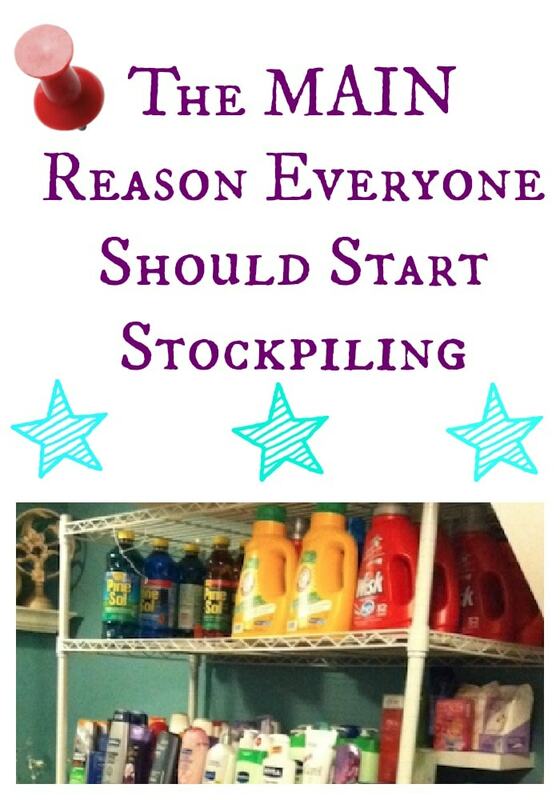 Your stockpile doesn’t have to look like the ones that are featured on Extreme Couponing. That’s just unrealistic. But have enough of whatever you need to last you a few months. All you need to do is clean out a corner in your basement. I’m not asking for a lot of real estate here. My husband has to do EVERYTHING for this family these days. Bed rest has become a real test for him. I KNOW for a fact that having that room downstairs makes things a little bit easier. And for that I am grateful. 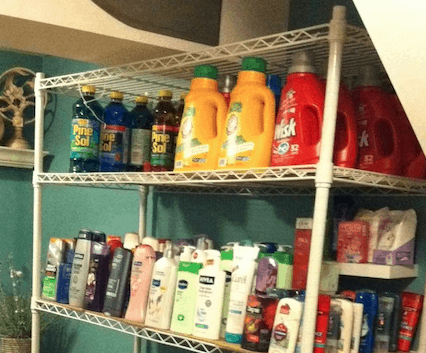 My husband thought I was a little weird for stocking up…until he lost his job!